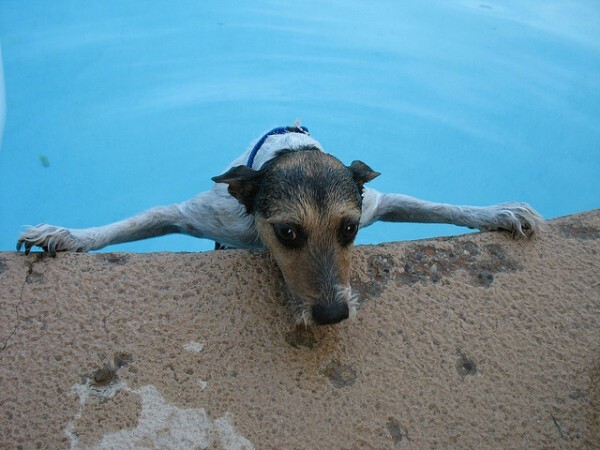 Springtime Dangers: Backyard Pools, Lakes & Rivers! After a long cold winter the days are getting longer and warmer and as a result both pets and people are starting to enjoy more time spent outside. Whether it be in your own backyard, strolling on walkways or heading to the cottage there is a very real danger for not only our pets but children also. Backyard pools, lakes and rivers that are currently still frozen or pools that still have a liner on them pose a real danger this time of year especially when the ice is beginning to let go. Often we see the ice has begun to let go at the water’s edge. This small amount of open water provides a drink and sometimes a source of entertainment for dogs, cats and children. Sometimes there is merely a few inches of water between the edge of the patio or land and the ice cover – just enough for a pet or child to fall into and potentially become trapped under the ice. We were deeply saddened this week to hear of a dear sweet pup who lost her life in the family pool. Once the ice and/or covers are off the pools the threat is still there although reduced. When there is an ice cover (sometimes substantial with the cool spring so far) the risk of a pet (or even worse – a child) getting trapped under the ice is something no one ever wants to encounter. While the ice is still on sources of deep water we wish to remind everyone to be diligent about ensuring all pets and children are under close and constant supervision. If the backyard pool has an ice cover, simply keeping the family dogs on a leash, if they have access, may be a bit of a nuisance but may potentially save a life. The lovely Mississippi River is currently running with such force that pets and people could be easily swept away with the strong current and undertow. May you all have a wonderful and safe spring!